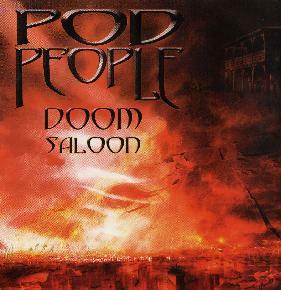 Pod People - "Doom Saloon"
Pod People are an Australian Doom metal band. I have not heard the band before but they have released 3 CDs and a few EPs as well and have toured with Entombed and Cathedral. The CD starts with Filling The Void, a pretty heavy but uninspiring track. The Missed is a bit more upbeat but the horrible vocals really take away from the song despite the cool groove. Roadblock starts with a bass solo and slowly builds things up and the vocalist sings in the background but sounds ok and makes it more melodic. Subterranean is a 10 minute track that takes some patience to get into. A bit like the Subhuman by Carnivore but not nearly as cool! After that they need to speed things up with Look Beneath. The CD ends with the Non Prophet, one of the best tracks on the CD. The band play some heavy stuff but fail to mix it up enough for me and I really disliked the poor vocal delivery. For me, the band does not do anything to stand out from the crowd.